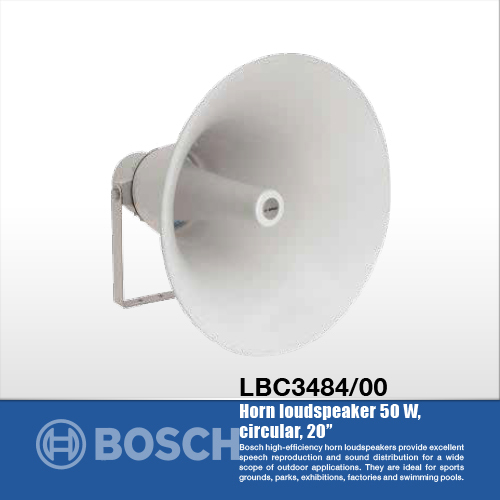 Horn driver 50 W, for use with LBC3403/16 (10"), LBC3404/16 (14"), LBC3405/16 (20"), and LBC3406/16 (15 x 9") horns. 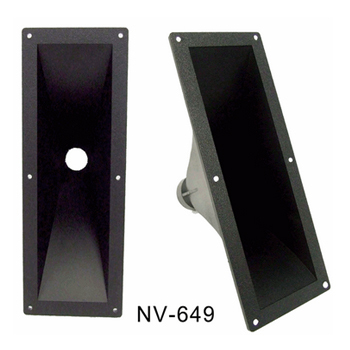 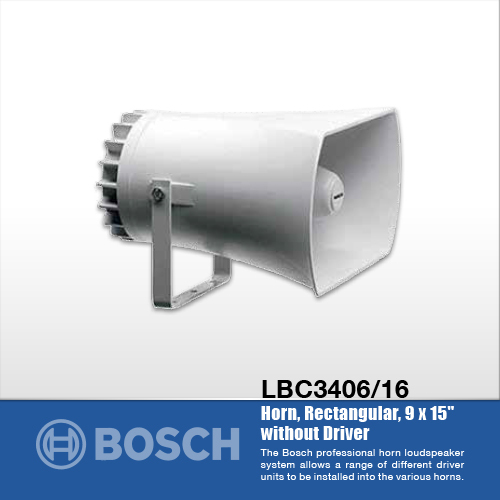 Horn driver 15 W, for use with LBC3403/16 (10"), LBC3404/16 (14"), LBC3405/16 (20"), and LBC3406/16 (15 x 9") horns. 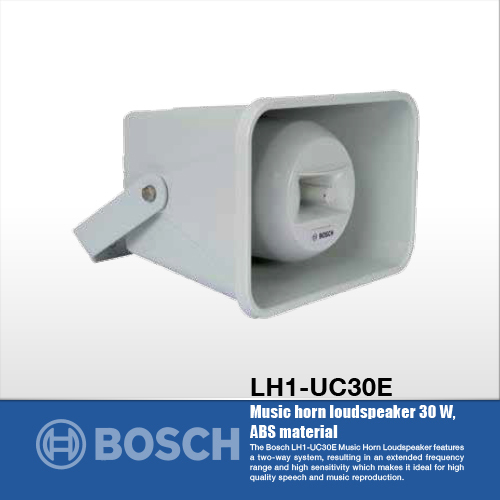 Music horn loudspeaker 30 W, ABS material, two-way system for high-quality speech and music reproduction, water and dust protected IP65, EN54-24 certified, light gray RAL 7035. 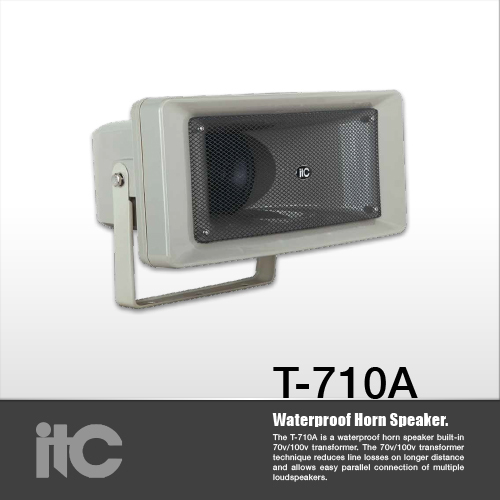 Horn loudspeaker 10 W, rectangular, 8 x 7", aluminum/ABS material, U-bracket mounting, water and dust protected IP 65, EN54-24 certified, light gray RAL 7035. 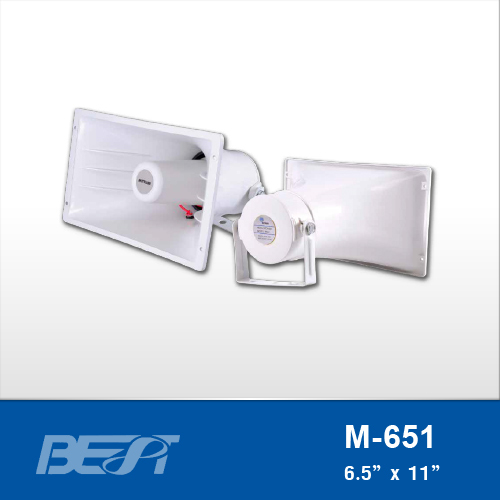 Horn loudspeaker 50 W, circular 20", aluminum/ABS material, U-bracket mounting, water and dust protected IP65, light gray RAL 7035. 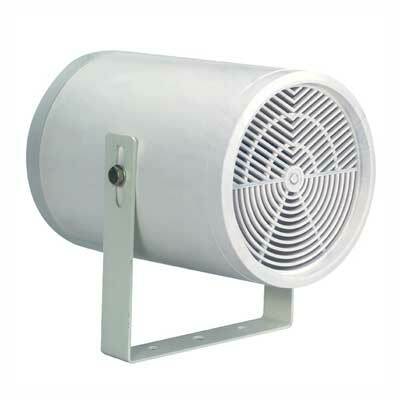 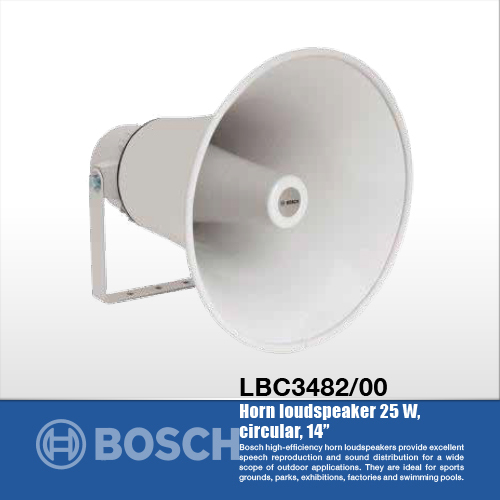 Horn loudspeaker 35 W, circular 20", aluminum/ABS material, U-bracket mounting, water and dust protected IP65, EN54-24 certified, light gray RAL 7035. 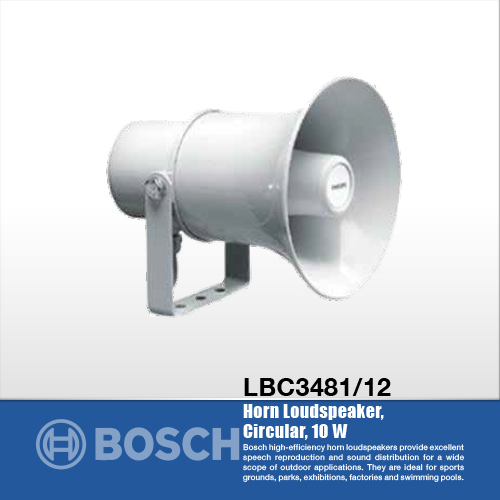 Horn loudspeaker 25 W, circular, 14�, aluminum/ABS material, U-bracket mounting, water and dust protected IP 65, EN54-24 certified, light gray RAL 7035. 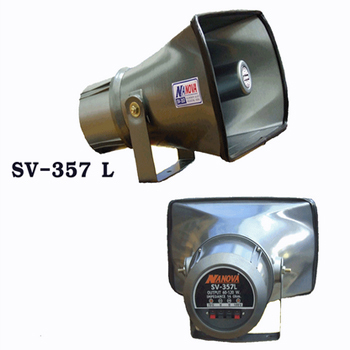 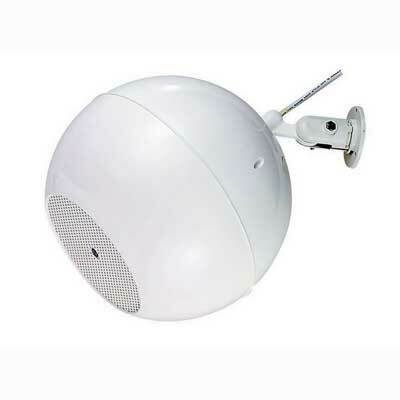 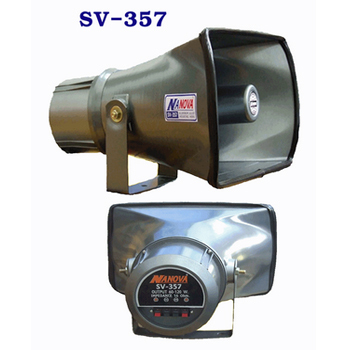 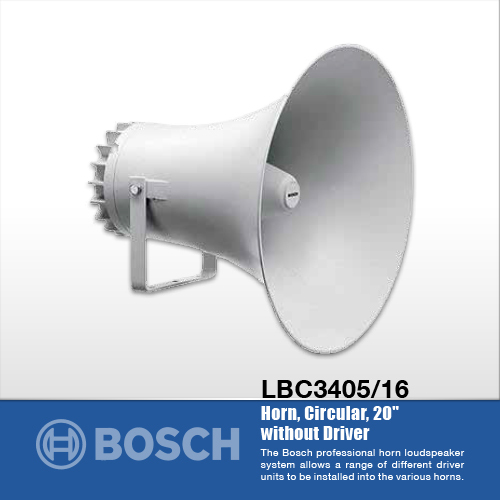 Horn loudspeaker 30 W, circular, aluminum/ABS material, water and dust protected according IP65, fixed 2 m, 4-wire connection cable, light gray RAL 7035. 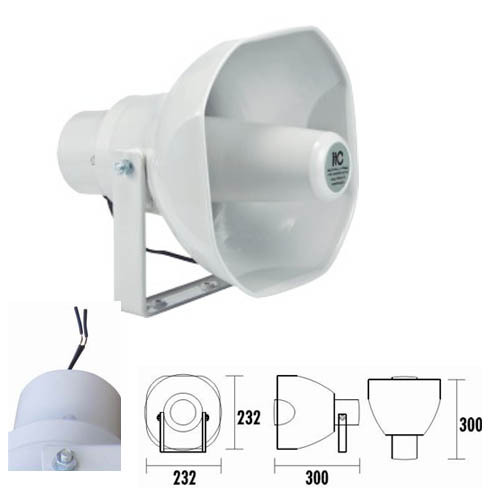 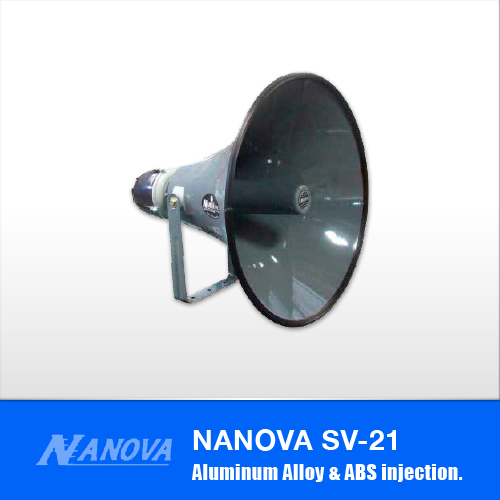 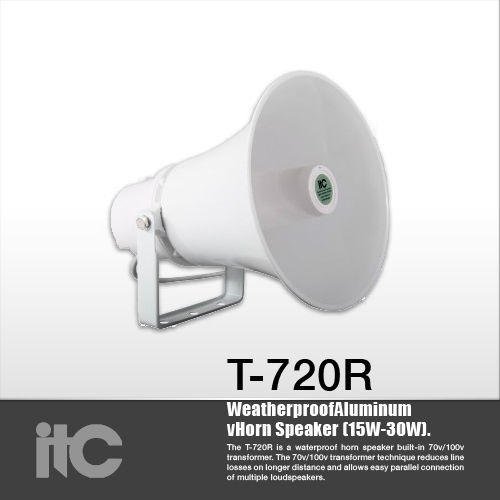 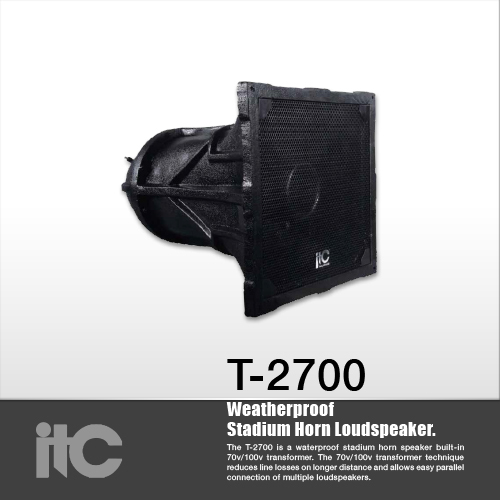 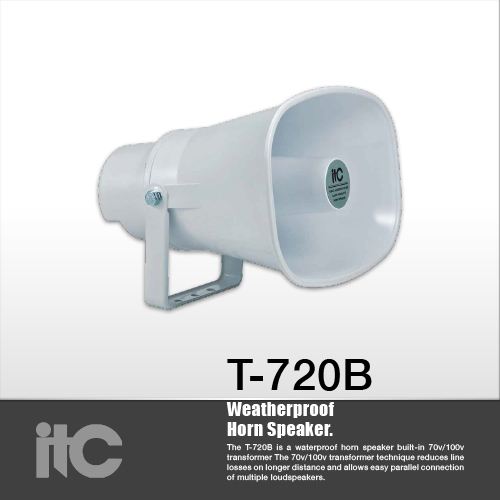 Horn loudspeaker 20 W, circular, aluminum/ABS material, water and dust protected according IP65, fixed 2 m, 4-wire connection cable, light gray RAL 7035. 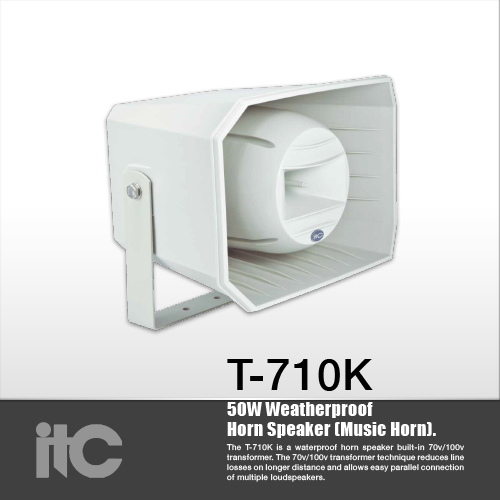 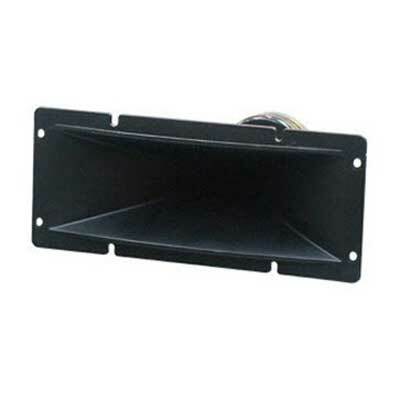 Horn loudspeaker 10 W, rectangular, ABS material, water and dust protected according IP65, fixed 2 m, 4-wire connection cable, light gray RAL 7035. 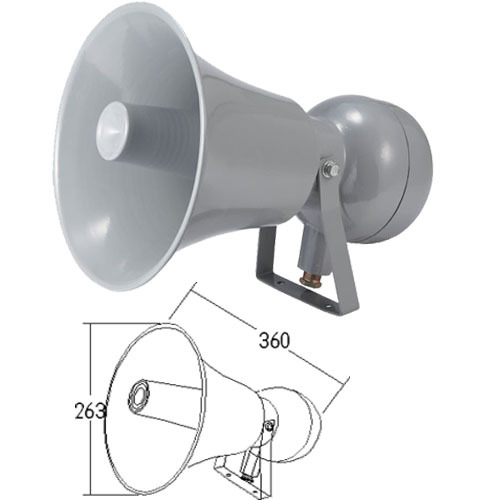 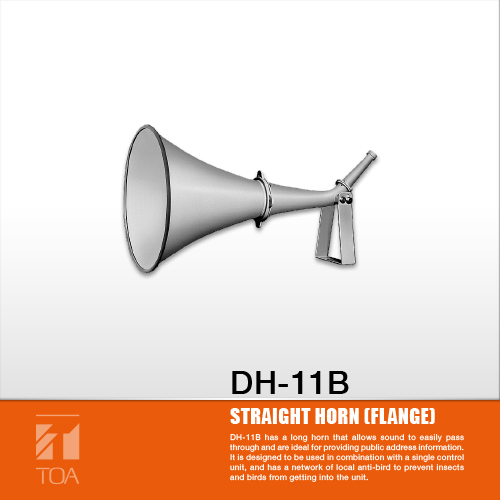 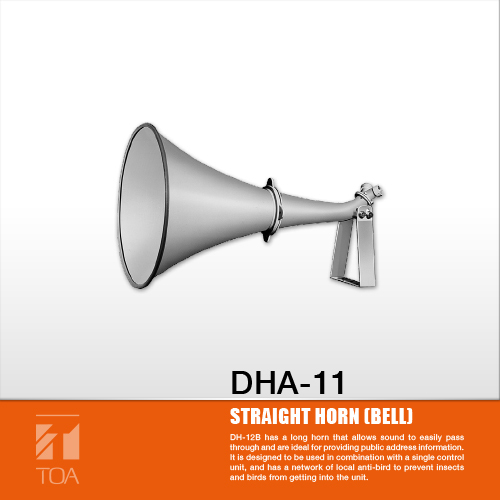 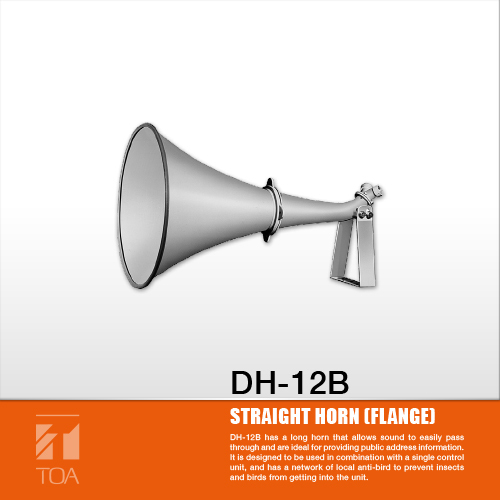 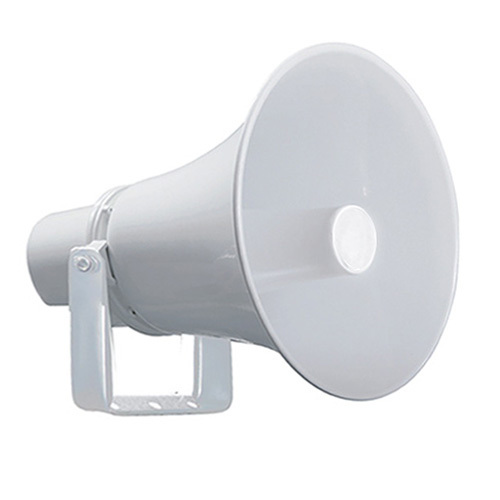 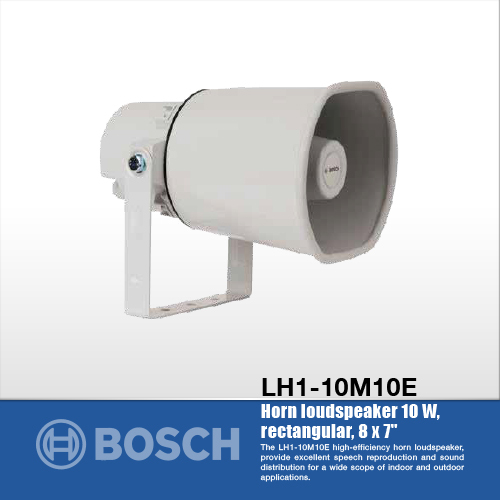 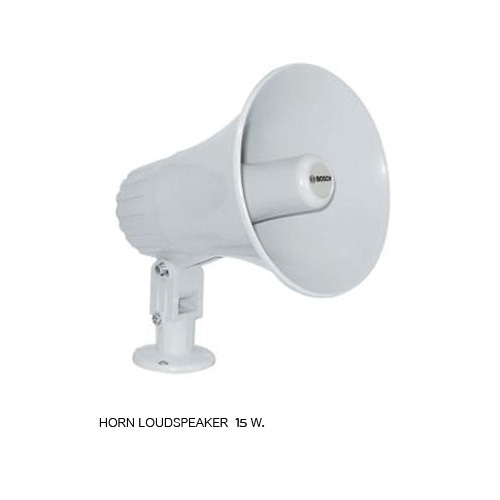 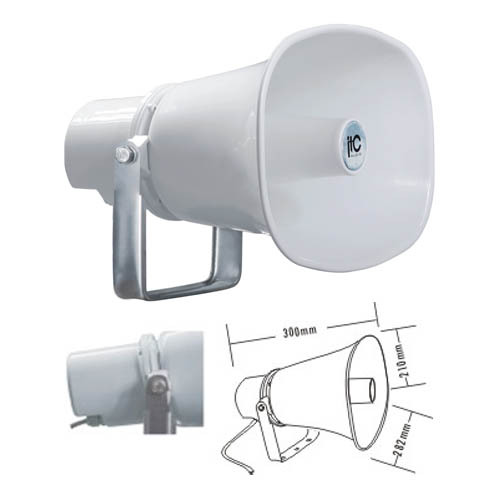 Horn loudspeaker 10 W, circular, ABS material, water and dust protected according IP65, fixed 2 m, 4-wire connection cable, light gray RAL 7035. 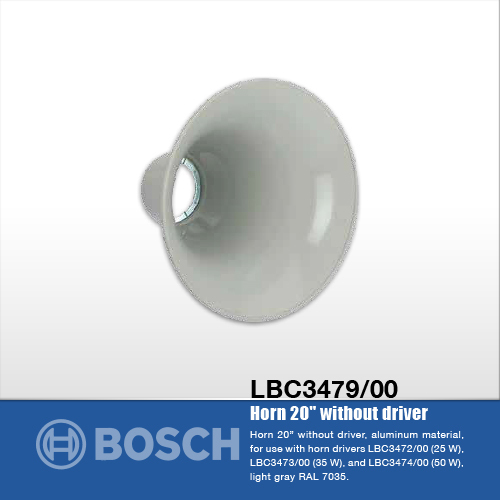 Horn 20� without driver, aluminum material, for use with horn drivers LBC3472/00 (25 W), LBC3473/00 (35 W), and LBC3474/00 (50 W), light gray RAL 7035. 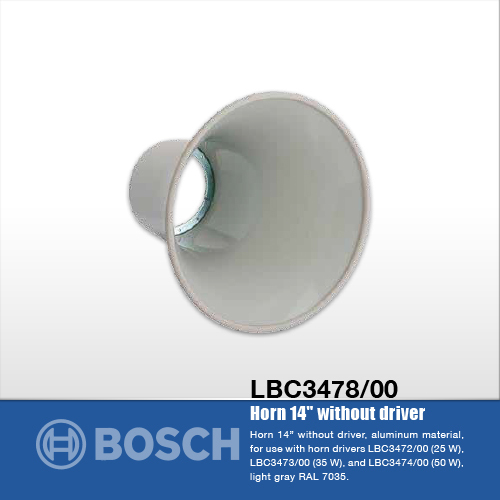 Horn 14� without driver, aluminum material, for use with horn drivers LBC3472/00 (25 W), LBC3473/00 (35 W), and LBC3474/00 (50 W), light gray RAL 7035. 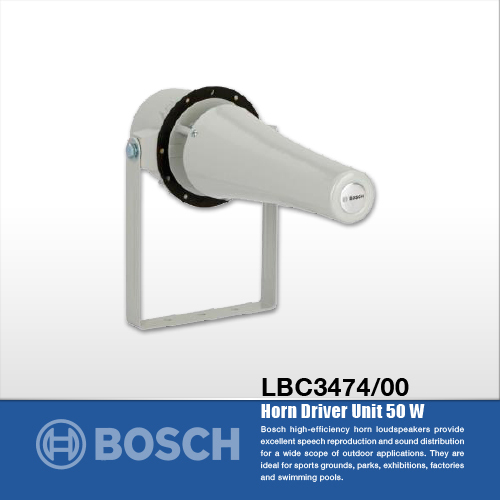 Horn driver 50 W, for use with LBC3478/00 (14") or LBC3479/00 (20") horns, light gray RAL 7035. 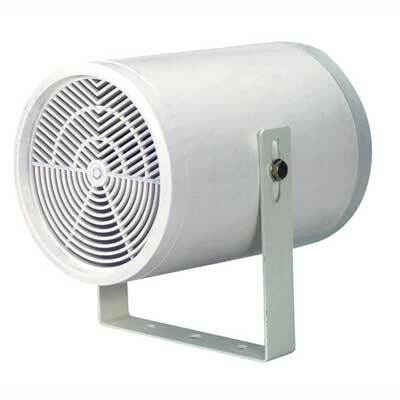 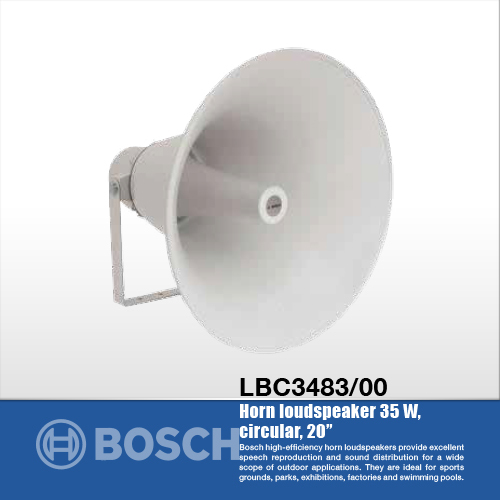 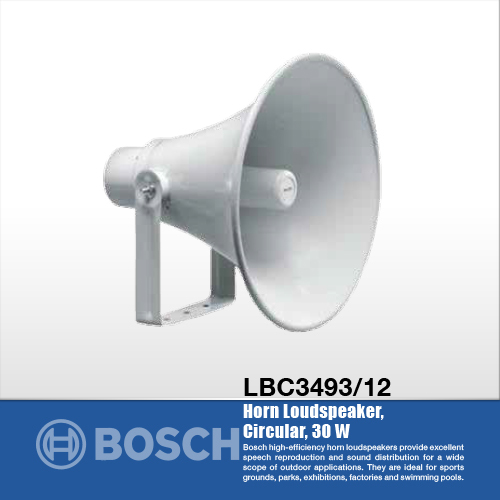 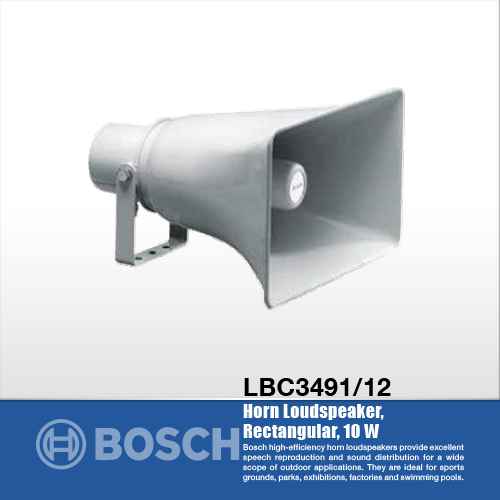 Horn driver 35 W, for use with LBC3478/00 (14") or LBC3479/00 (20") horns, light gray RAL 7035. 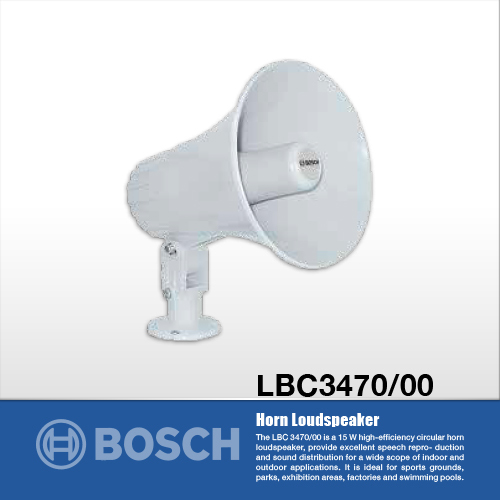 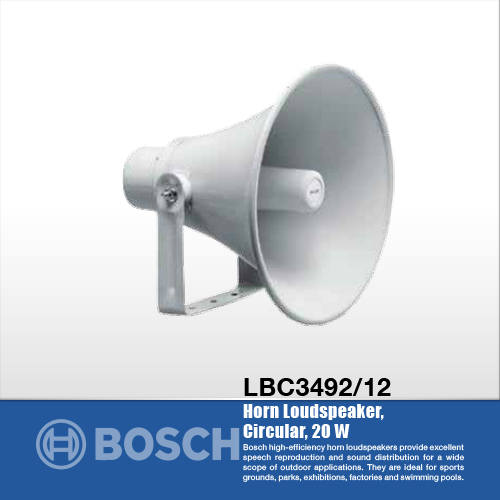 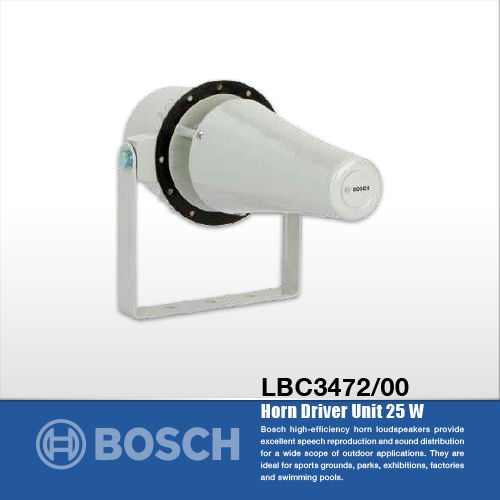 Horn driver 25 W, for use with LBC3478/00 (14") or LBC3479/00 (20") horns, light gray RAL 7035. 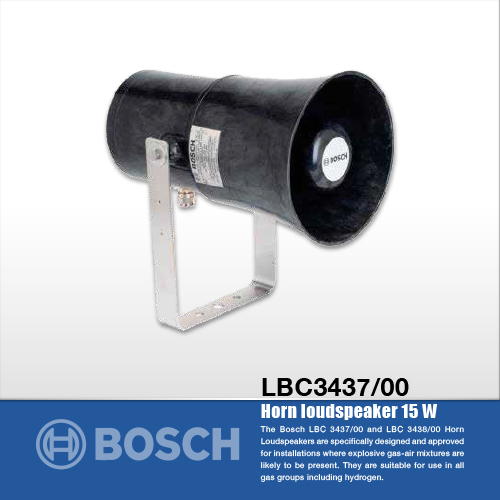 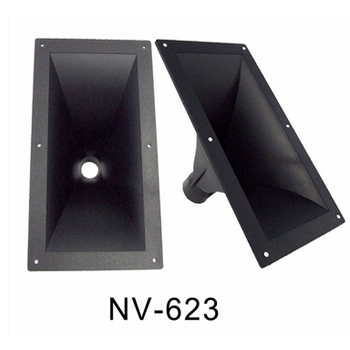 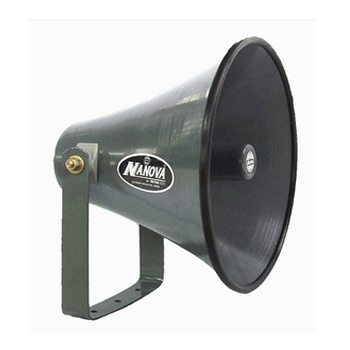 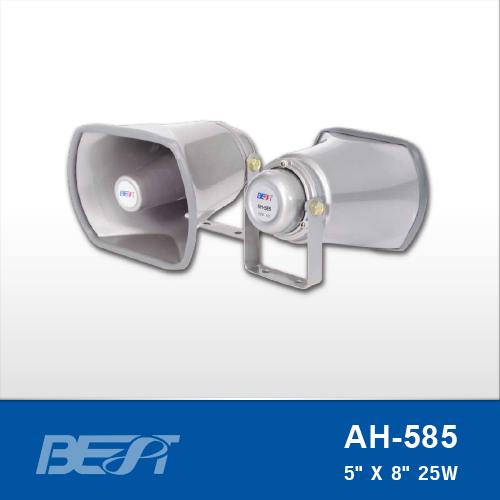 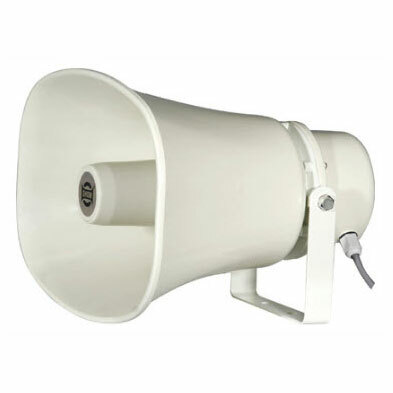 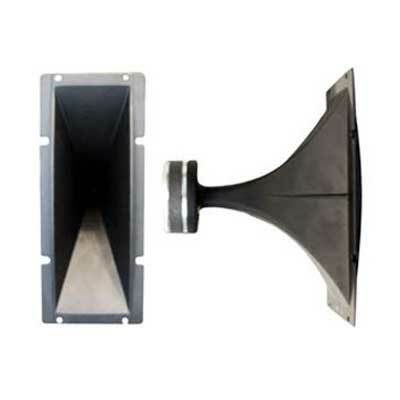 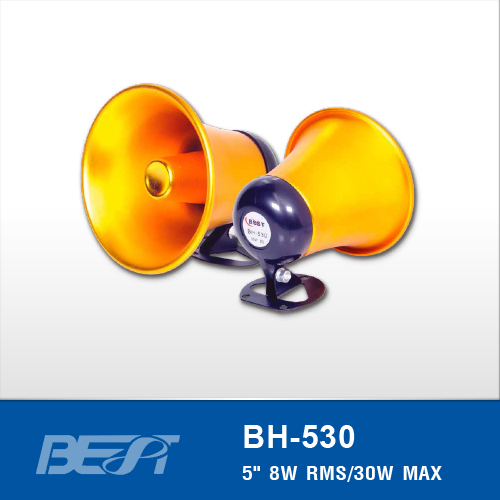 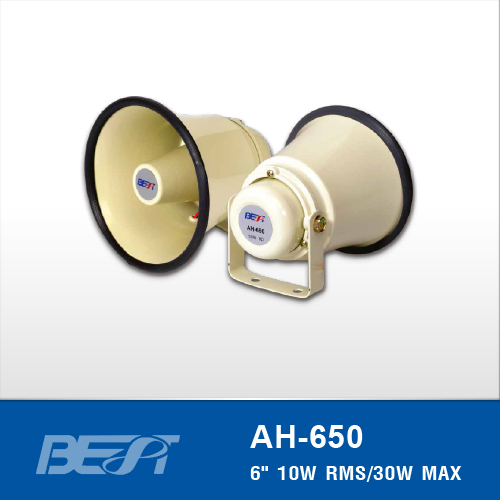 Horn loudspeaker 25 W, circular, GRP material, flameproof, ATEX EX II 2 GD approved, BASEEFA EExd II C T4, zones 1 and 2 , water and dust protected IP67, natural black. 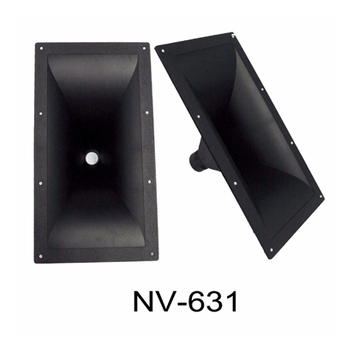 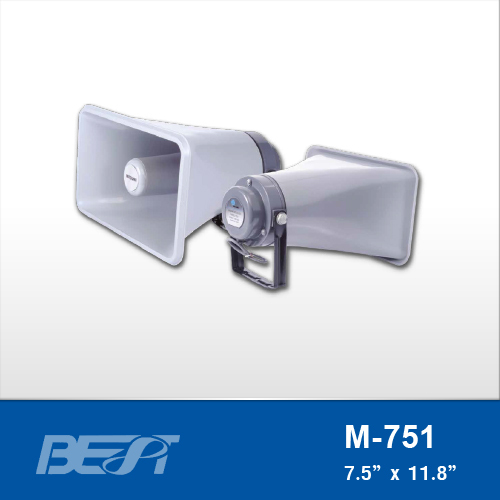 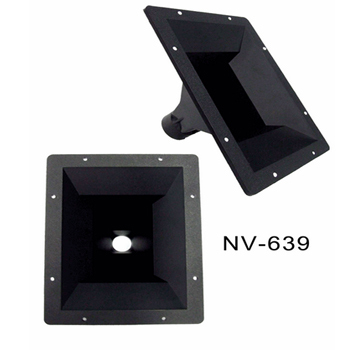 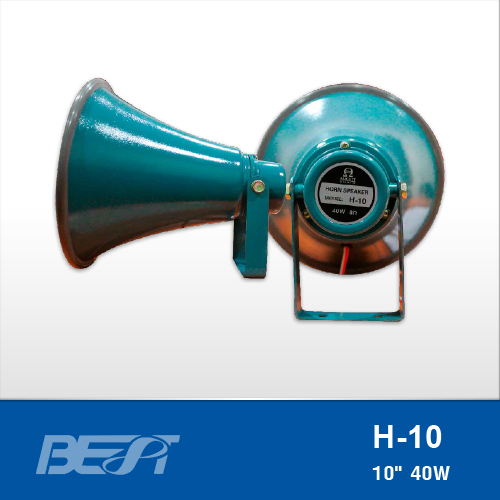 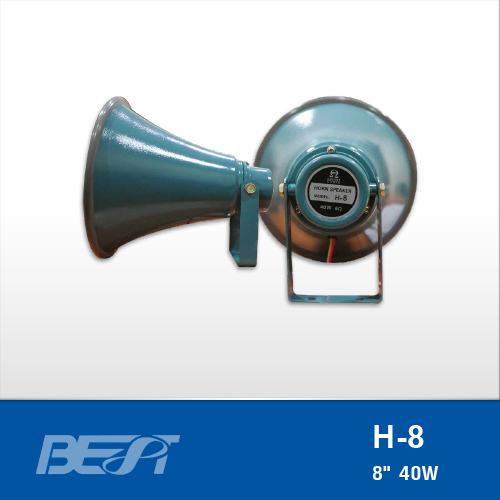 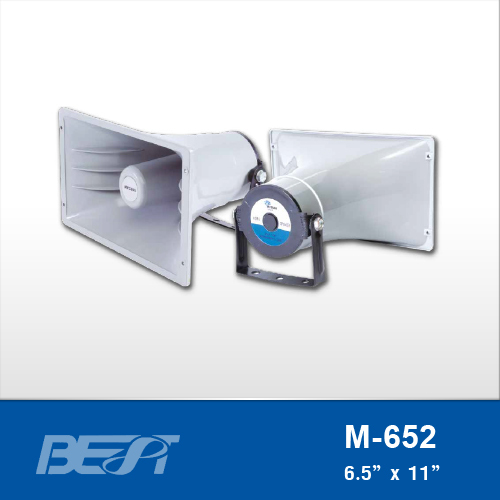 Horn loudspeaker 15 W, circular, GRP material, flameproof, ATEX EX II 2 GD approved, BASEEFA EExd II C T5, zones 1 and 2 , water and dust protected IP67, natural black. 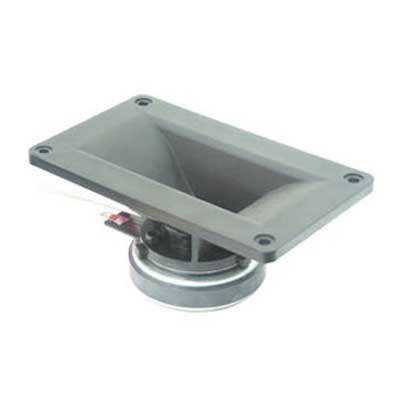 Horn 15 x 9" without driver unit, rectangular, high-impact ABS material, suitable for use with horn drivers LBN9000/00 (15 W), LBN 9001/00 (30 W), and LBN9003/00 (50 W), light gray RAL 7035. 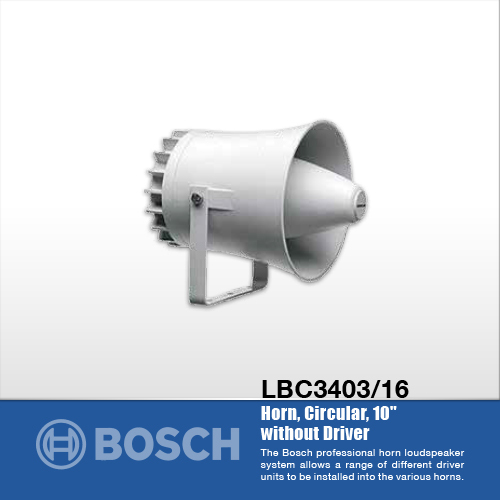 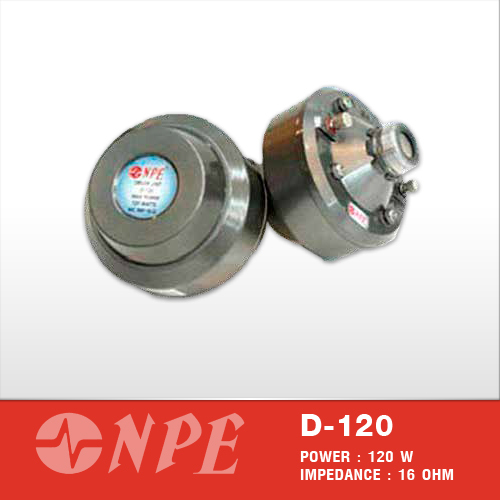 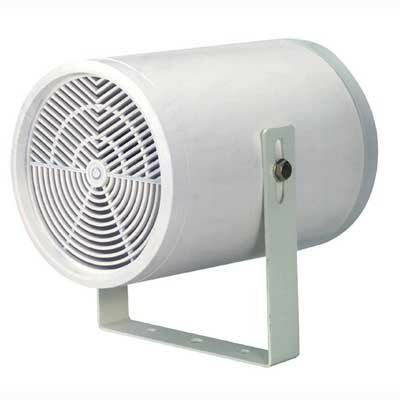 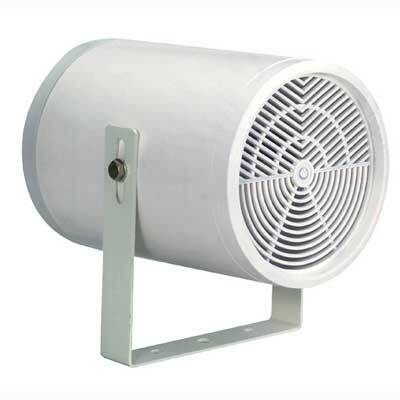 Horn 20" without driver unit, circular, high-impact ABS material, suitable for use with horn drivers LBN9000/00 (15 W), LBN 9001/00 (30 W), and LBN9003/00 (50 W), light gray RAL 7035. 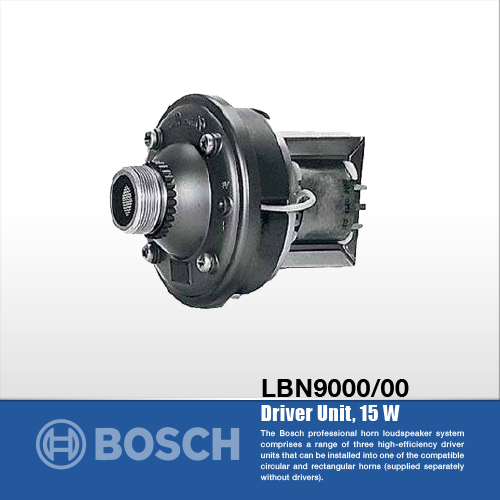 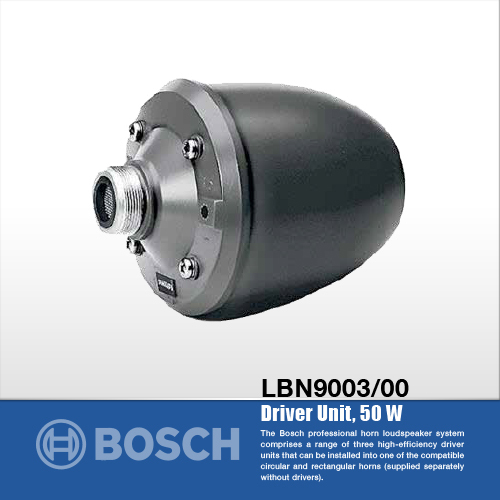 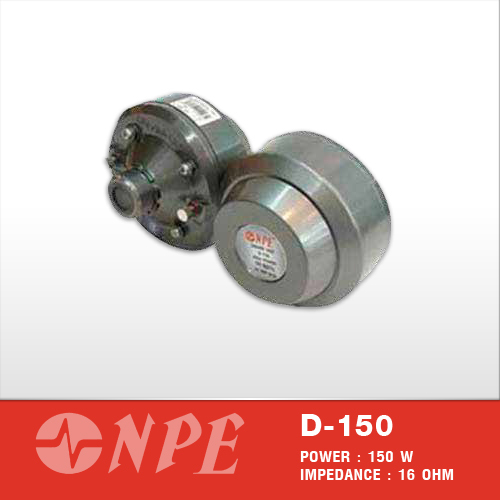 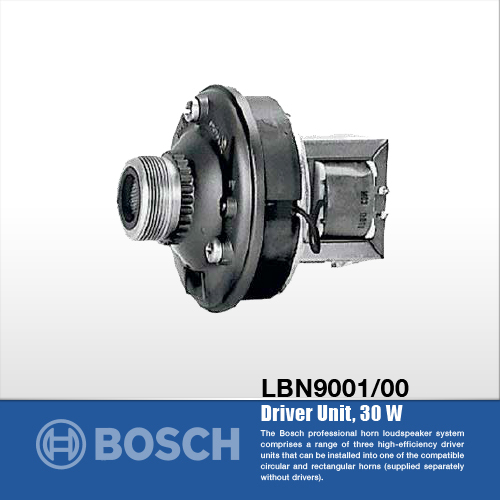 Horn 10" without driver unit, circular, high-impact ABS material, suitable for use with horn drivers LBN9000/00 (15 W), LBN 9001/00 (30 W), and LBN9003/00 (50 W), light gray RAL 7035.